Because I'm short. But it's getting hard to put regular shoes on with this baby overtaking my tummy. So I bought some fugly shoes the other day. Clarkes. Plain black. Boring. Slip on flats. And I'm loving them. Not only are they easy to put on but they feel like absolute "buttah" on my feet. I'm sooo all about comfort right now... So please, excuse my feet for a while. Yeah, boots are bad but tying my running shoes is the worst right now, won't be able to do it much longer. 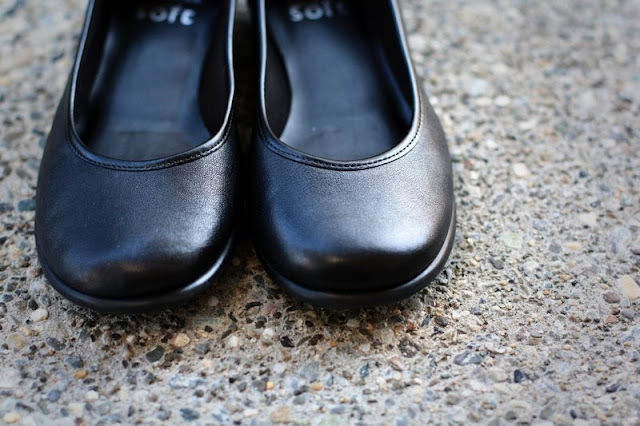 I really get it now, Flats are so much easier to wear! And perfect for the mall and trying on clothes. Just slip off. And on! And off. And on. I loved those little red and white stiped flats you wore to Bon Jovi.. So cute!